Now, mind you, I’m not shy or ashamed about my wearing or showing my hearing aids. The Bridezilla in me was mortified about ears sticking out in photos more so than hearing aids being shown in photos–I feel it’s important for me to clarify that–and more so, liked the aesthetic of long, flowing hair against the most elaborate and colorful outfit. 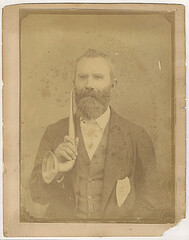 The caption describing this image remarks how wearing an ear trumpet was an unusual subject for any photo and much effort was made to deliberately conceal ear trumpets. 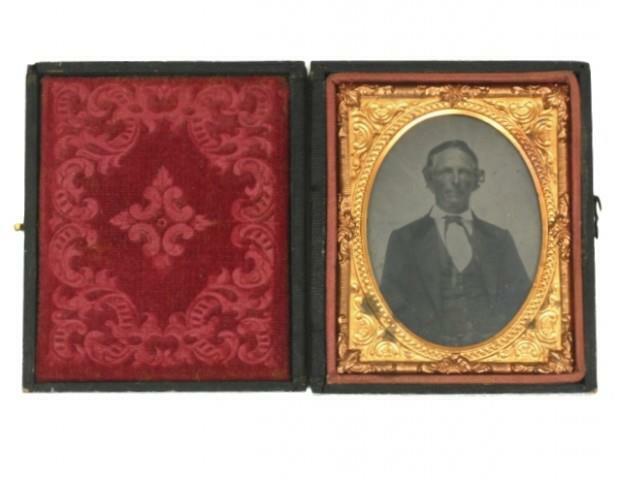 Clearly this ambrotype from around 1851-1880 (United Kingdom) suggests a proud owner. 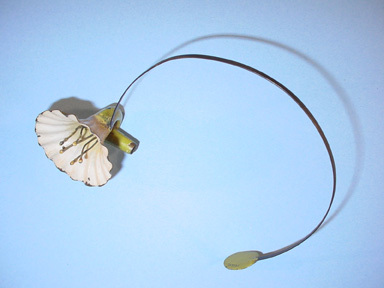 Others were cleverly disguised and delicately crafted to be worn on the person as according to the fashions of the time, like this stunning floral Aurolese Phone (F.C. Rein, 1802) which still shows its original white and green paint. 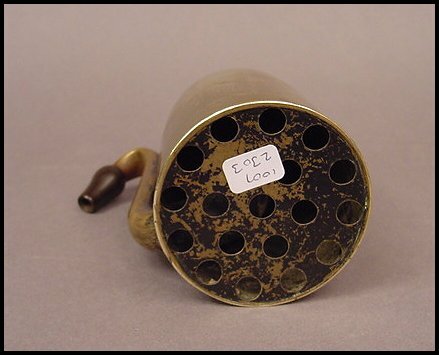 Seriously, I’ve seen this in person, and it is a stunning artifact, perhaps the most beautiful one I’ve ever come across in all my visits to hearing device exhibits. It is also quite functional as well, providing an acoustic benefit up to 10 dB over a limited frequency range, suitable for someone with mild hearing loss. A very rare 19th century ivory ear trumpet which unscrews into two parts. 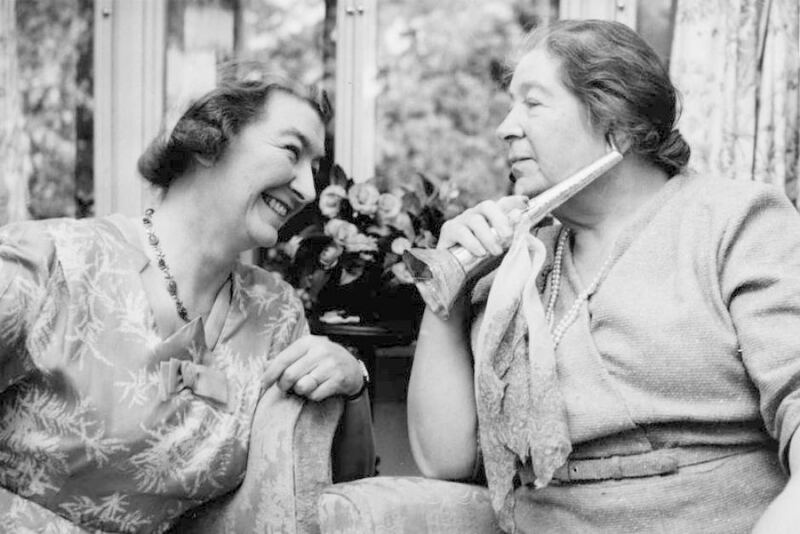 I started a searching for a variety of photos of individuals photographed wearing some kind of hearing trumpet or ear horns. To me, these photos suggest something particular about the individual: that for them, the artifact was inseparable from their identity, inseparable of how they saw themselves and how they wanted to present themselves to the world. 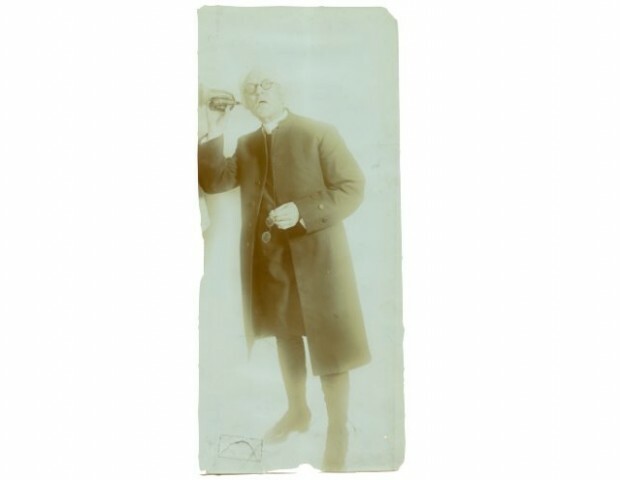 Man with ear trumpet, c.1890-1920. 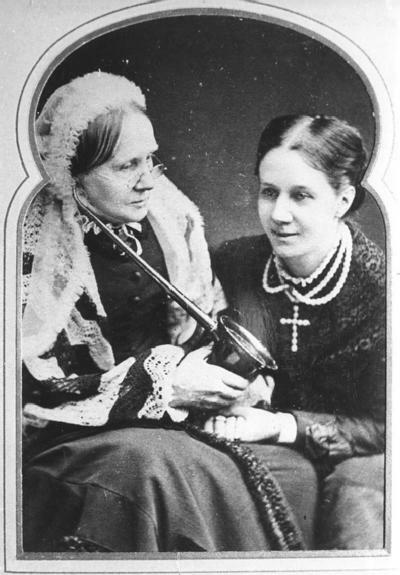 Mary Greg (was Mary Priscilla Needham) and daughter Amy Greg sitting beside her. 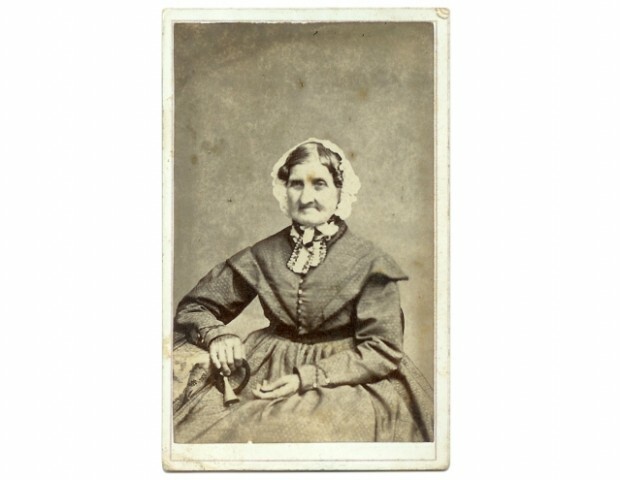 Special thanks to Laurie Slater from Phisick Medical Antiques for granting permission to repost some images! 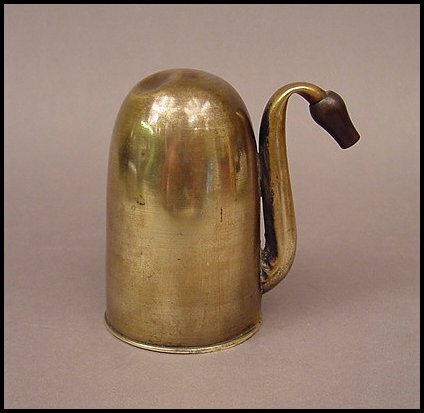 Edit: this is the instrument that Dr. Alderman refers to in his comment below–likely brass, late 19C. How disappointing the BDHS did not obtain the ear trumpet! 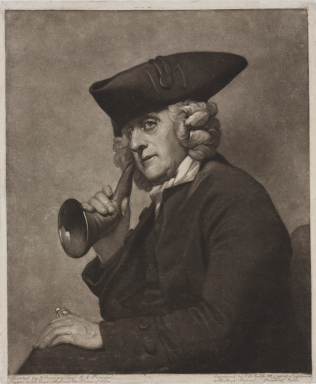 There is a very good section on Ear Trumpets in the book ” A Beginner’s Introduction to Deaf History” by Raymond Lee (ed). Published by the British Deaf History Society (BDHS) in 2004. 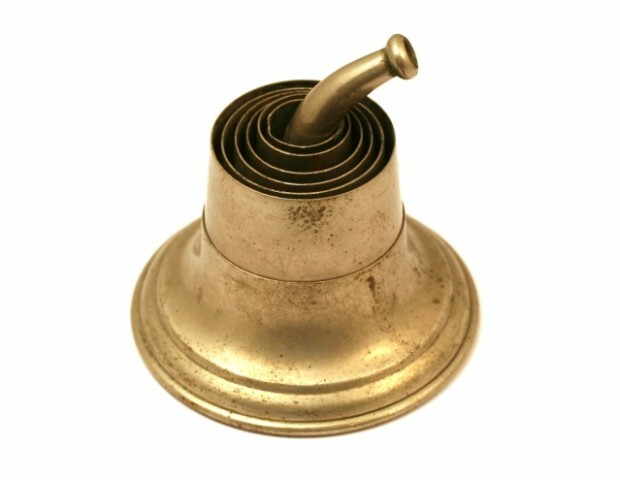 In 2005, the BHDS was unfortunately outbidded for an antique ear trumpet that became available on Ebay. 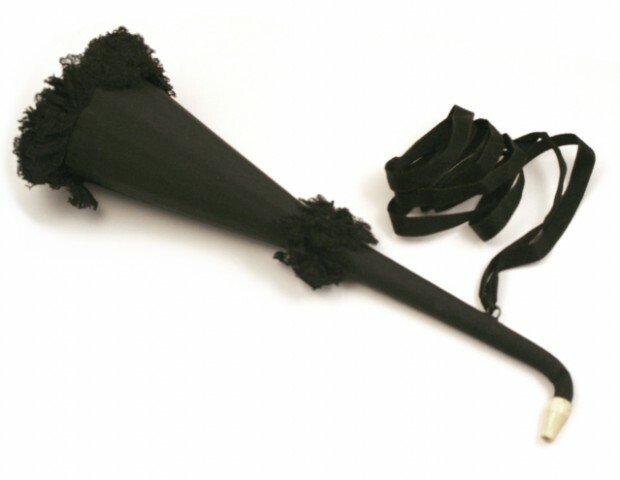 I have the photos for this particular ear trumpet which I will send you by email. Nice post Jai—great photos. I was actually thinking the title indicated that you had tried using an ear trumpet. Maybe you have? How do they work? Many of these, like the silk one and the flower one, seem like they favor form over function…. 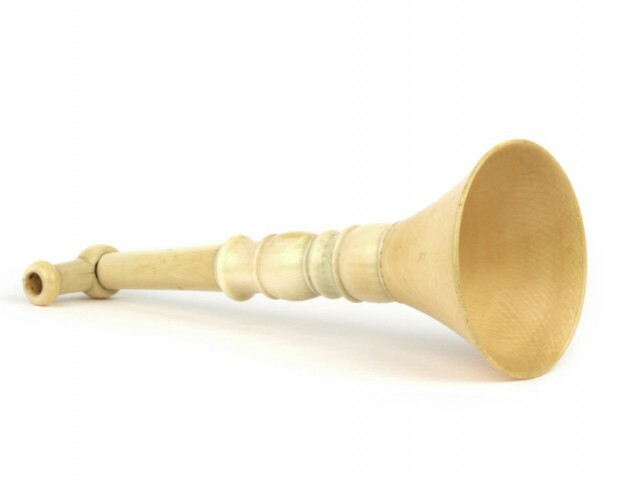 I also don’t think the aesthetic design of an ear trumpet undermined its acoustic benefit–a lot of instrument makers applied sound theories related to musical instruments into the making of ear trumpets. Design was just an add-on, possibly a marketing strategy to attract favorable clients (like rich ladies). That’s really interesting, thanks Jai. You obviously would know better than me, but thinking of things like supermarket tomatoes that look great but taste like nothing, I’m a little surprised that a similar kind of thing wouldn’t be going on with these devices, especially if those in the market for them were concerned with how they looked in public. The amplification quality of different types of ear trumpets probably led people to try out different types to figure out which was a best fit–i.e. the trumpets and horns delivered sound quite differently. Hi Jai I remember back in school (sometime in the distant past) looking at replica trumpets. Then looking at some in a museum. Dammed if I can recall the museum though.